Natural food colourings. No preservatives. To prepare only with hot water. Kosher - Parve.Good to know... Osem Jel Dessert contains only natural food colours from vegetable extracts. 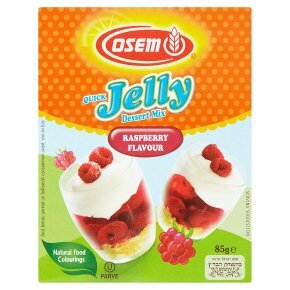 A serving of Osem Jel Dessert is a sweet and tasty treat. Preparation: 1. Empty contents of the package into a bowl. 2. Add 2 glasses (400ml) of boiling water. 3. Stir well until dissolved. Use whisk for a better dissolving. 4. Pour into serving dishes. Serve after chilling.